I am broken and other words to be aware of! We really need to be conscious of our conversations, especially those we have with ourselves. I used to tell myself, ‘I am broken’. I felt broken. My hands were sore, my body ached. Everything I did took effort. There were a lot more utterances of I can’t than I can. Emotionally I felt broken too. I had been through quite a bit during my marriage and the break-up and I didn’t seem to be able to settle into a new relationship. What I didn’t realise at the time was that the words that I spoke and the thoughts I had were just making things worse. In January this year, I started on a new career path as a business coach specialising in Personal Branding. I have been training, practicing, reading and learning for months. It has been a privilege to work alongside one of my oldest friends who is a business coach supremo – with two masters degrees under her belt and a PhD in progress. As I was a bit cash strapped I offered to do some content writing and marketing for her company. Fair exchange for some of the tutelage. The first job I was tasked with was writing about Conscious Leadership Conversations. The idea of being so conscious of a conversation was new to chatter box me. The message was simple but profound. The content of our conversations is vital and can ultimately lead to increased productivity and efficiency. Executives spend a huge amount of time in meetings – and in conversation and the quality of that conversation is vital. But what about the conversations we have with ourselves. Sitting down at your desk and saying – even to yourself – I am so stressed, I will never get through this. She is driving me mad. I am so frustrated with this place. All those words are basically prophecies. When I was working in Westport and had to take a half day off to go to the hospital, I would go in an hour early and get stuck in. I set myself tasks and motivated myself telling myself that I could get everything done and be in the car by 1pm. I also reminded myself that everything would go smoothly and I wouldn’t get any calls on the road. Those half days were sometimes the most productive days I had. So now, despite the days when I am tired and in pain, I speak to myself kindly and wisely. I guard against saying words like broken, stressed and frustrated. Now I am very conscious of my conversations with others and with myself. I love words and have been practicing my ‘word of the year’ idea for 5 years now. Words are incredibly powerful. If you want to read some of my previous word of the year posts have a look at these links – Balance, writing about my words, and this year’s word – detail. 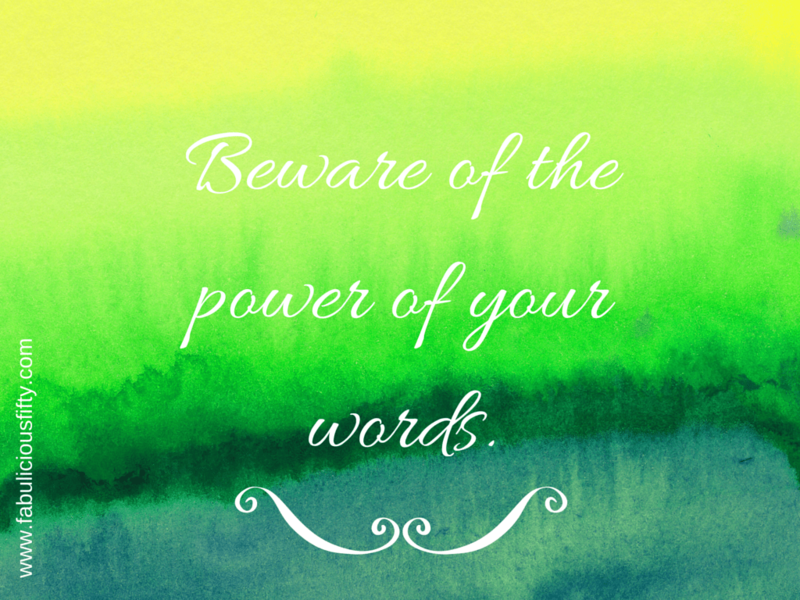 Be aware of the power of your words, they can come back to bite your or they can lift you closer to your dreams. « Why I started wearing a Fitbit when I am probably not very fit at all?